To build a powerful yet compact dive light from the ground up, Light & Motion made use of their vast knowledge of lighting technology. The result of that labor is a solid, hands-free range of waterproof lights featuring integrated batteries, and is now sold in multiple configurations that serve the diverse needs of videographers, photographers and recreational divers alike. The build quality of the new SOLA line of submersible lights is nothing short of top grade. The ergonomic construction of the lights has actually made them smaller than some backup lights, weighing them in at a mere 287 grams. The bodies of the SOLA lights are built with a durable, impact-resistant plastic, which makes them lighter, but does not cheapen their feel at all. The aluminum ring around the head of the lights serves as an effective heat sink that can diffuse the built-up heat generated by the beam into the surrounding water. Surely one of the light’s best features are its simple-yet-functional pair of Velcro straps that affixes the SOLA comfortably on the topside of the user’s hand, allowing them to use that hand freely. 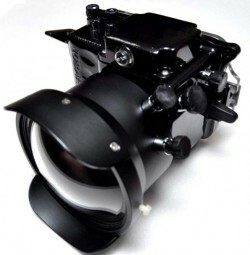 Light & Motion also makes a lockline system, so that the user can exchange the wrist mount for a ball mount and attach the light directly to a video system. The body measures in around 57mm x 101mm, and houses a sliding magnetic tap switch, which can be locked by a quick quarter-turn to avoid accidental activation. Sliding the switch forward cycles the light output through three varying three levels of brightness. 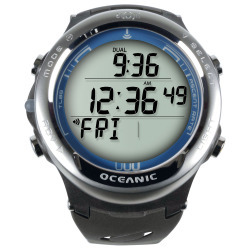 There’s also an illuminated brightness indicator that doubles as a battery life meter. Pulling the tap switch backward switches between spot and flood beams, on all the SOLA DIVE models but the 500, which offers the narrow beam only. To turn the unit off, simply hold the tap switch in the rear position for three seconds. Another feature that most will love (and few might dislike) is the internal, non-user replaceable battery. Light & Motion and many other companies have found that a significant number of problems with their products actually stem from their consumers’ attempts to reassemble the product. Any slight errors can easily result in a partially or completely flooded unit. Light & Motion has taken this issue out of the equation by doing away with the need to deal with lids and o-ring seals. Instead, they provide external connectors for charging the light so it never has to be pried open. The flip side to this is the user can’t make any quick fixes if the battery dies. However, given they are Lithium-ion cells, this shouldn’t be too much of a concern. Despite its diminutive size, the SOLA light packs a considerable punch. With a tiny, rechargeable lithium-ion battery, the beam will last for more than 70 minutes at its highest output, and several hours on lower brightness settings, depending on the model. The SOLA has a 75 degree beam angle on the flood setting, and 13 degrees (give or take) for the spot beam. At the 2010 DEMA Show this past year, Light & Motion provided AtlasOmega a duo of demo units to test, the SOLA DIVE 600 and SOLA DIVE 1200. 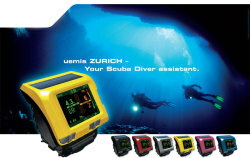 The differences between the SOLA 600 and 1200 came to light after a dozen or so dives with the two models for comparison. Despite being identical in size and appearance (aside from the 600 or 1200 label marked along the bezel surrounding the lens), the 1200 packs a powerful beam, appearing twice as bright to its counterparts to the untrained eye. Regardless of their compact size, the 600 and 1200 still output incredibly smooth wide angle beams devoid any hot spots, making them ideal for videographers. The narrow beam angle is perfect for recreational divers, but a wider 13 degree beam might not be as focused or tight as others prefer. Nonetheless, with their fail-safe durable construction and efficient energy use, the 600 and 1200 are proof that Light & Motion is edging closer to creating a dive light with the same beam power and quality as many canister lights found in the tech diving market. Diving with an extra free hand and a powerful beam from a near-weightless light makes the experience with the SOLA 600 quite enjoyable. Simply put, the SOLA line of dive lights from Light & Motion is highly impressive. It is incredibly useful when others need a spare ‘primary’ light for a dive, and with its simple build and airtight ergonomics, divers of any experience level can use it to its full potential. After all, it is much easier to put a Velcro wrist mount on a new diver in a standard BC than a canister light with similar beam quality. The only change Light & Motion should apply to the new SOLA line would be elastic band material instead of the 1î Velcro straps for its wrist mount. 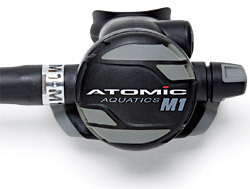 This could make donning and removal quick and effortless, without compromising any security underwater. Beyond this minor change, its compact form combined with its extraordinary beam output makes this new SOLA line a game-changing tool for the videography, photography and recreational dive light markets. This entry was posted in Dive Gear, Underwater Photography, Water and tagged dive gear, lighting, underwater photography. Bookmark the permalink. Post a comment or leave a trackback: Trackback URL. I dive with the Sola 600, I love the red light for sneaking up on my subjects. Great product! Hello,I just bought a sola 500 ,but am concerned becaus i lost the instructions and dont know how to remove the integrated battery in case I have trouble passing the secvurity checks. Janine, you cannot remove the integrated battery from the SOLA. It should not be a problem to bring the unit onto the aircraft as carry-on, through airport security. I do it all the time.